Talan started preschool. Last Friday marked two weeks. My little boy is growing up and I can't help but feel a little anxiety about it all. I send my three year old all the way across town on the little school bus.... It's the only school in the district with a special needs program. For weeks I was nervous after multiple evaluations as they figured out his school placement and IEP documentation. So many thoughts raced through my head when they told us their decision. Would my baby be safe? Did the school district do background checks on the bus drivers? Would the bus have a car seat with a five strap harness? I kept myself up so many nights over the entire thing. It was bad and I was unsettled for weeks. The first four days of preschool I drove him to school each morning. It was a twenty minute drive across town and twenty minutes back to my eldest son's school. I was content with that. 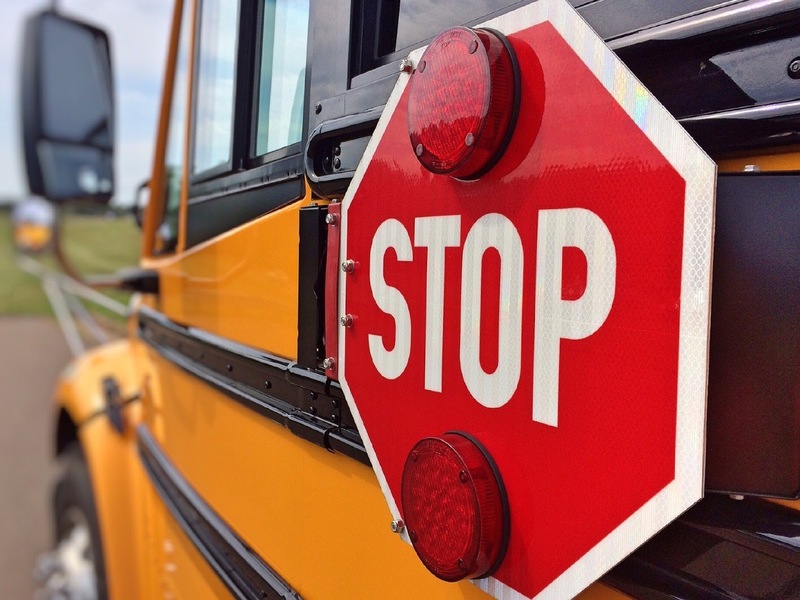 I was the one taking my son and some of the fears that I had went away until the transportation department called me to schedule the first day he would take the bus. Transportation would start on a Thursday and all those feelings came right back. I barely slept that night. Was it wrong of me to get so worked up over something so simple? It was just a school bus. The next morning I put the youngest two in the wagon and walked along side my oldest son. Anxiety ate at me like the plague as I pulled the wagon along the street. It was a gray and chilly morning and that nervous, anxious feeling ate at my belly and was consuming me. I had no idea how Talan would handle the school bus and honestly I was a little scared for him. He's only three after all. Talan was used to going to school by now. He had been going for a week in total. I just hoped that he would enjoy going to school on the bus. The sound of it driving down the street pulled me out of my thoughts. I looked at Talan who stared wide-eyed at the small but big yellow vehicle coming down the road. It stopped in front of us and the door swung open. The bus driver Jim greeted us with a hello and Talan hopped out of the wagon and climbed up the steps and onto the bus like he had done this before. I followed him and helped him into the car seat with a five strap harness. Yes, buses have car seat's for preschool-aged children if you did not know that. I asked because I was stressing out about it! I kissed his forehead and told Talan I loved him and that I would see him tonight when I got home from work. When he realized that I wasn't going on the bus with him he cried. He cried hard. My heart broke as I got off the bus and waited for it to pull away. I stared after the bus as it drove down the road and disappeared around the bend. I'm not going to lie, I felt a little sick and sort of defeated. I felt like a bad mom but deep down I knew that this was for the best. Talan was going to school to work on his cognitive and social skills and that was really all that mattered in the end. He's one brave little boy. He's always been that way. It has been a full two weeks now that he has been taking the bus to and from school. He loves it! I enjoy our walks to the bus stop each morning. It has become one of my favorite things to do during the day. Every morning I look forward to our walks as we listen to the birds chirp and Talan points at the blossoming trees, the animals he sees, and enjoys making his little sister laugh as I pull them along in the wagon. I watch Amari run up ahead; stick in hand as he pretends to be a Storm Trooper or a Jedi. All of my fears and anxieties have washed away. I now find it rather silly that I was so stressed out about the entire bus riding thing. It was stupid now that I look back on it all. Bus stop days have and will become some of my fondest memories and I will hold on to them dearly from now on. This is beautiful! My daughter hasn't begun preschool yet and just thinking about it brings me to tears. You handled it so well! Thank you Paula! I hope your daughter has a wonderful experience with preschool. My son is having a blast.